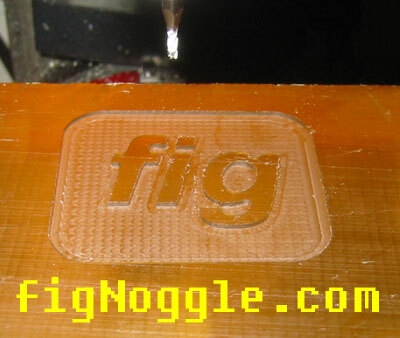 here's some stuff made with the cnc machine. maybe some manual creations are here as well. 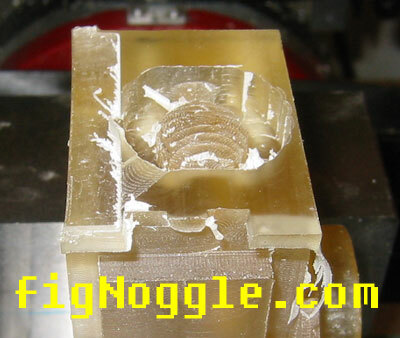 this is only a test..
here's the resulting circle contour milled after both the x and y axes nuts were modified to reduce backlash. MUCH better than before this had been done. using a 1/16" dia. 4-flute, contoured and pocketed some text in a box. 1st cut in aluminum. 3/8" dia. 2 flute endmill. it's 1/2" thick aluminum. what is it? i don't know. it's a doodad. here's the final part. the material was not sufficiently secured to the base. during the last pass as the part became parted from the stock, the part came loose and an emergency stop was made. it was "secured" using double-sided tape. 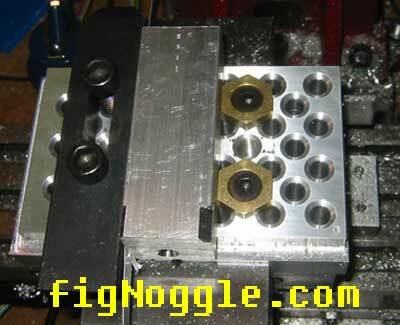 the clamps clamped both ends of the stock, but as the part is machined, it no longer is secured by the stock. problem. a real part being made. 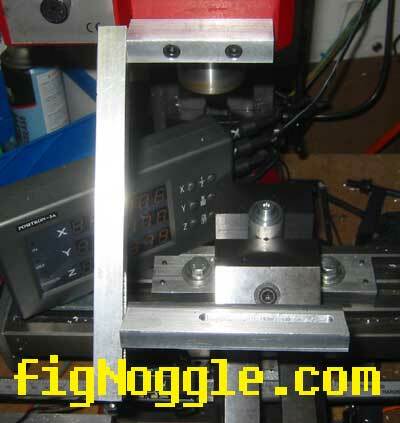 the x-axis motor mount. old (then-current) x-axis motor mount. 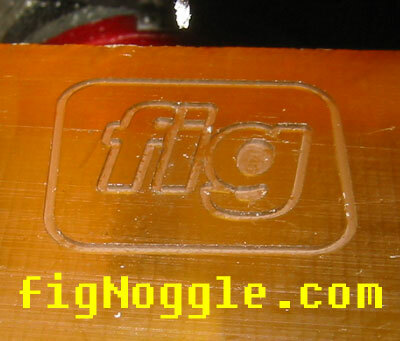 this is the one in the cnc page. here i'm setting the origin. really, there should be an origin somewhere off the part. just before the final fillet and parting from the stock. watch the fillet being cut and the "dancing chips"
this was to make a quick part. used hot-glue gun glue to prototype the part. works great if the part can be flexible. this was machined manually. 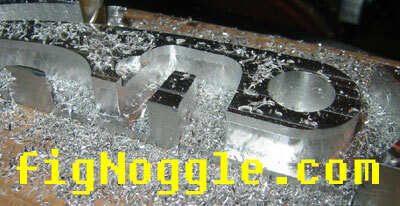 with CNC, the part can be machined with complex contours (and 3D). this is a camera holder for smaller digital cameras. this is version 1.
version 2 has more articulating pieces (and will be made via cnc). version 1 was just a prototype and was milled (even with the articulation that's not shown manually). 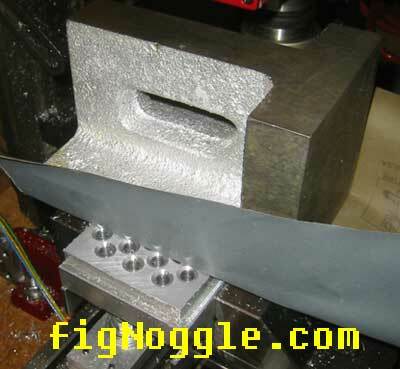 cnc mounting base (aka "clamp base") - there was a scrap piece of aluminum stock that was an ok size for holding down small parts like the acetal nut that's being tested. 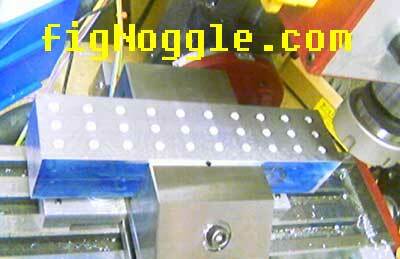 a series of 5/16"x18tpi holes are being drilled and tapped (it's the same size as the step block set used with the phase2 horizontal rotary table). 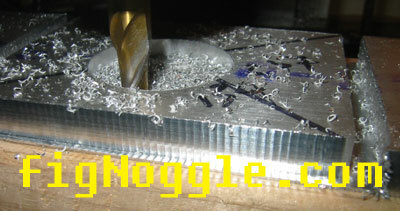 actually, the tapping part was done manually so to save time, only holes that needed to be tapped were at the time. 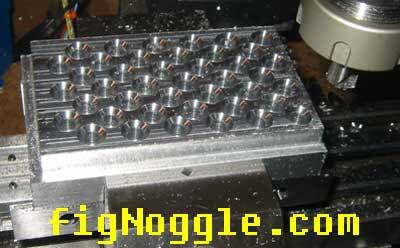 all holes were center drilled and drilled 1" deep with an "F" machine screw bit chucked in the er collet. 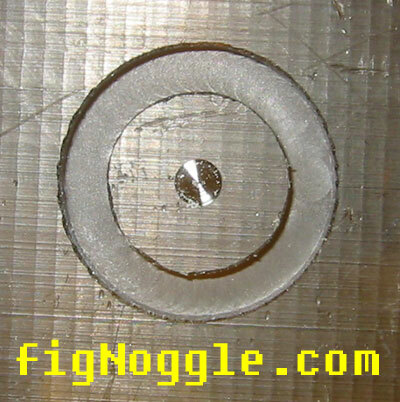 can you imagine drilling this series of holes (30 in total) with this precision? that's a lot of work. during one of the hole drills, the motor stalled and an emergency stop had to be made. it's time to hook up the motor to driver board and mach so that should the motor stall, mach (or whatever other controller software) will stop as well. more on this procedure later. 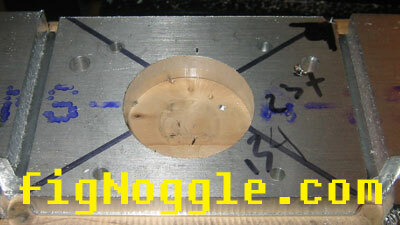 another workholding jig (a "v-plate") was made as well. here's the clamp base being drilled. thinking of also adding a timed air-spurt to blow off swarf and immediately after, inject a droplet of tapping fluid onto the bit. btw, the lps tapmagic "gold" is pretty good stuff. stinks like you wouldn't believe - a cross between eucalyptus/menthol and burning gases. definitely a good idea to work in a ventilated area. in the past, wd40 was used to lubricate (since it was there and was in aerosol form), but now only tapmagic is used. 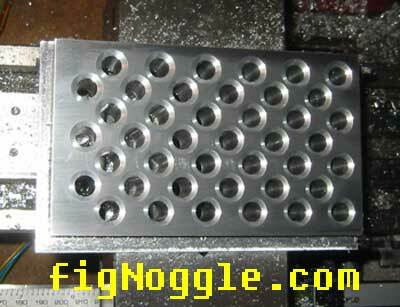 here are the 30 holes drilled. nice and even - the entire process took 30 minutes or so. 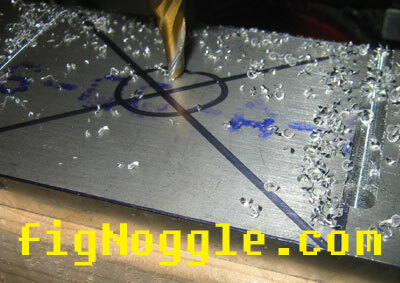 used a peck/drill at depths of .1 per peck plus .25" retracts off the top of the workpiece is roughly 1 minute/hole. 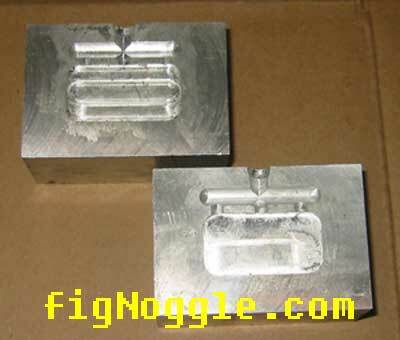 here is the acetal block clamped and ready for cnc milling. the machine returned to these coordinates after this entire procedure. 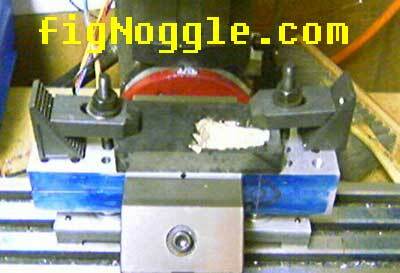 it's great to see that a cnc-converted mini mill bought for under $500 can do this kind of work - very impressive! this is a machine capable of doing small production work. we're working on getting a super x3 from sieg and converting that as well (given logistics and costs involved by going direct, we may end up buying from grizzly after all). it would be great to have the parts cnc machined using the X2 for the X3. this is similar to the above base, but is going to be tapped for 3/8"x16. 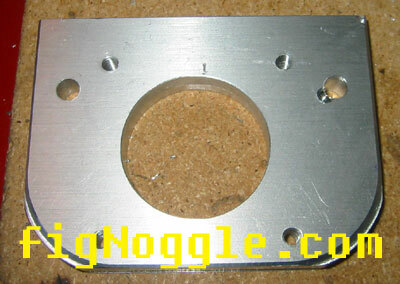 the holes are center-drilled. again, imagine doing this manually! 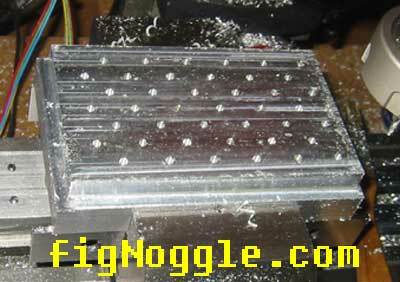 the holes (42 of them) are peck drilled 1" deep with a 0.05" peck and a 7ipm feed and ~800-1000rpm so as to avoid stalling the motor (which happens when chips get lodged). this would have been a good time to have liquid cooling and lubrication. standing in front of the machine for close to 45 minutes clearing chips and squirting tapmagic cutting/tapping fluid wasn't all that fun. in fact, anticipating a gear break, motor stall, lost step was enough to keep you at arm's length from the ESC button! after flycutting the face of the plate, it was sanded smooth with 400 grit wet/dry paper under the weight of a right angle block. all that's needed is to push and pull the block. no need to press down since the weight is evenly distributed across the face of the plate. here's what less than one minute of sanding produced. btw, as we did earlier, holes will be tapped as needed. 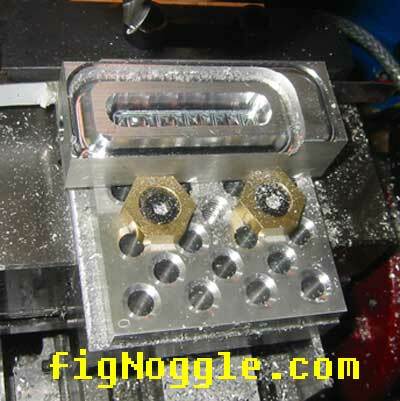 imagine tapping 42 holes in this workpiece manually! this would be a good time for a tapping head or the superx3. now, the real test is a small 1" square bar held in place with two mitee bite clamps. 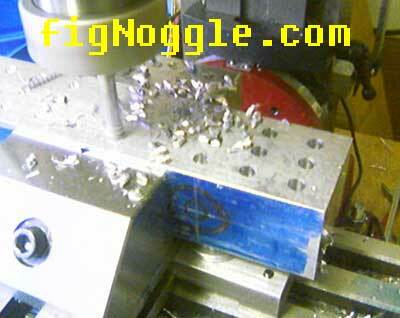 the workpiece didn't move at all. these mitee-bite cam action clamps are great! 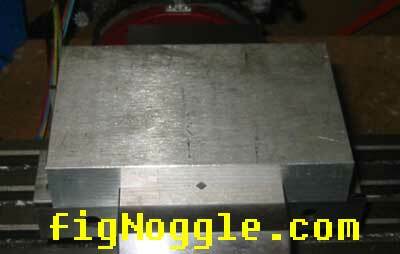 now it's time to make a real clamp plate with strategically placed holes for more flexible clamping.